Is it official? 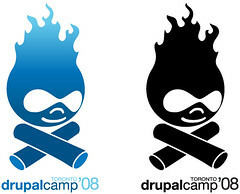 Is this the new "official" Drupal Camp Logo. Well, no, nothing's official when it comes to druplicon, but it certainly seems to be catching on. Its now been spotted in Toronto, Montreal and L.A.
Of course it was in Toronto first and all thanks to the wonderful folks at Substance Communications who designed the logo and have been kind sponsors to Drupal Camp Toronto for two years running. Patricia and Crispin of Substance are looking into sharing the artwork with the Drupal community. I'm sure such a move would be a hit in Drupal land. Looks like its become a hit. Let em know you love it. Its that time of year once again. Time for the Third Annual Toronto Drupal Camp. For the 3rd consecutive year, the Toronto Drupal community is coming together for the most conference like un-conference of the season. We expect there to be 150 attendees for the event, with people coming from across Canada and near-by US states. Be Circle is once again proud to sponsor this event. Officially, the event is presented by the Toronto Drupal Users Group with the support of the Drupal Association. However, this event is entirely organized by volunteers and Drupal enthusiasts from around the Greater Toronto Area.